Not like few other hotspots of the area, but a cool place to spend some quite days. Badshah Thaul has a slice of history and an eye on future. It is actually a educational hub with main campus of Hemvati Nandan Bahuguna Garhwal University located right at Badshah Thaul. Just three km ahead at Ranichauri is research centre campus of Pantnagar Agriculture University. 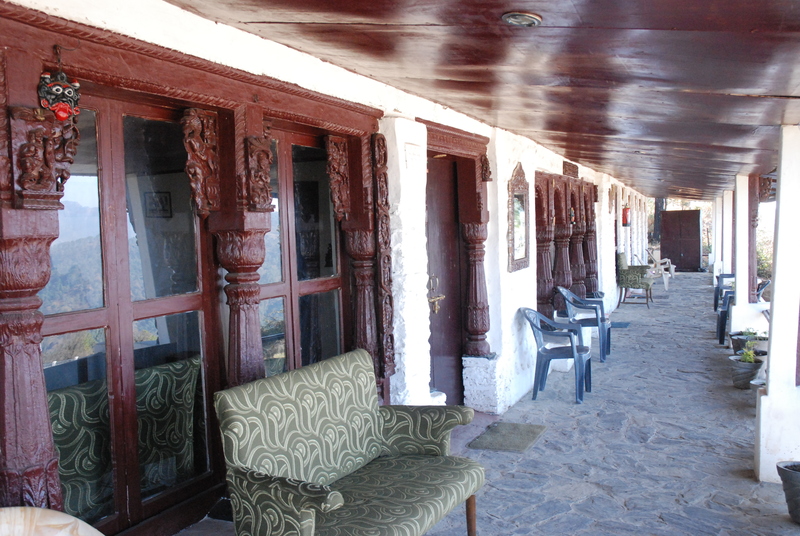 Badshah Thaul was historically one of the places, where the (Tehri) king used to have his court (Durbar) whenever he was on move in the area. Hence was derived the name. Now regular local fairs are being held at this place. 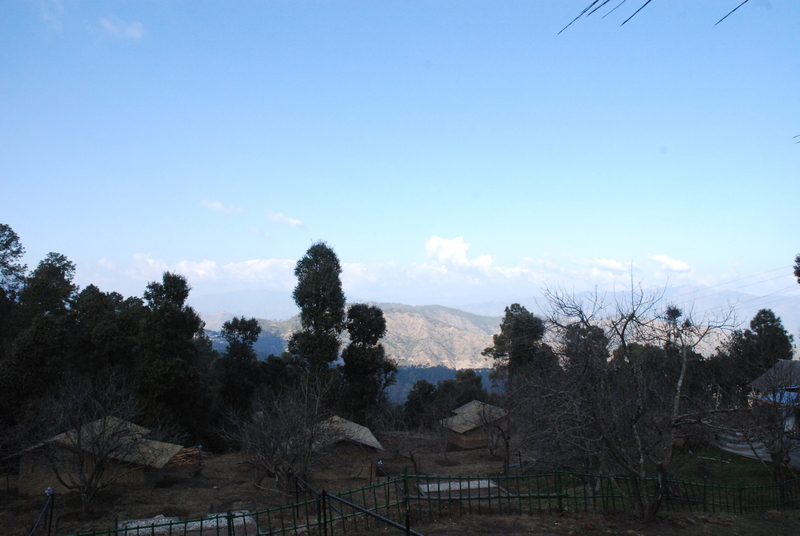 From Badshah Thaul one can see the hills of Dhanaulti and also the hill where one of the most revered goddess of the region Surkanda Devi is seated. 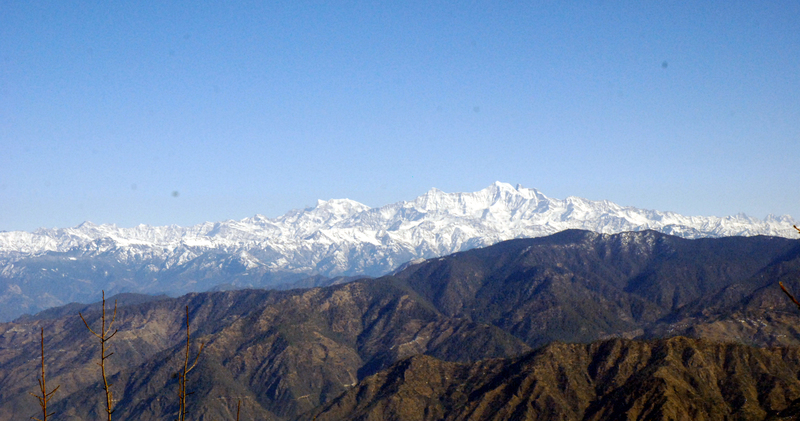 Badshah Thaul is facing north-west towards hills of Dhanaulti-Mussorie region. But just do a fifteen minutes trek to the top of hill on your back and on the other side enjoy a beautiful sunrise behind Bandarpoonch and Chaukhamba peaks. 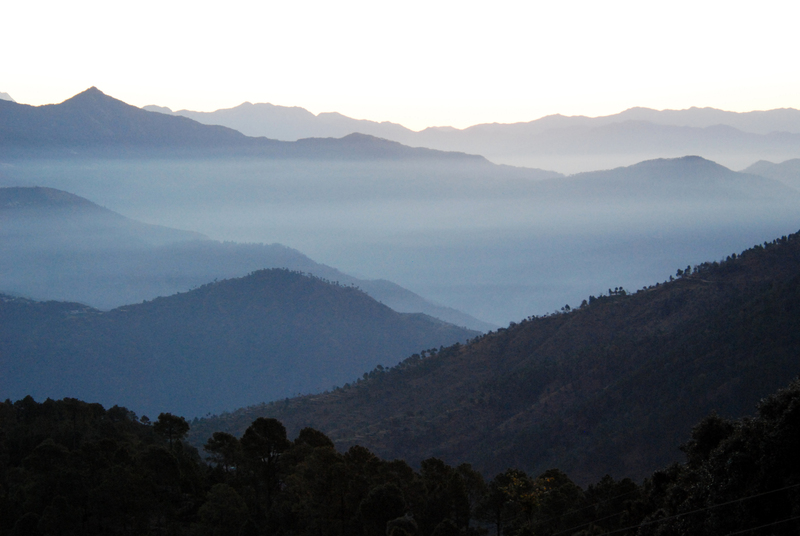 A beautiful view of the valley on the Tehri side. Something, that you will find the most here is the temples. Right at the Badshah Thaul (1 Km from the Darbar resort) is the Adi Surkanda temple. Temple is on hill top and there are stairs to climb. A 10 minutes walk. At Ranichauri village there is a Punyasini Temple, 200 metres downhill. This is a newly built temple, but there is another historical temple of Punyasini 2 km from Ranichauri in the hills. The temple there is still on a rock as it historically used to be. But only way to be there is to trek through pine and oak forests. There is a Raj Rajeshwari temple 15 km from Ranichauri. From Badshah Thaul you can see village Sable down in the valley. There is said to be a historical Shiv Temple there. You can trek down to temple from Badshah Thaul. It is more than a km. But return uphill trek could be tough. Alternatively, you can drive to village. It is on Chamba-Rishikesh road- four km from Chamba. 7 km from Badshah Thaul and 3 km from Pantnagar University gate is Dandachalli. In local dialect Danda is a hilltop and Challi is derived from Chahal i.e. a small pond of water. Hence Dandachalli has few such small ponds. 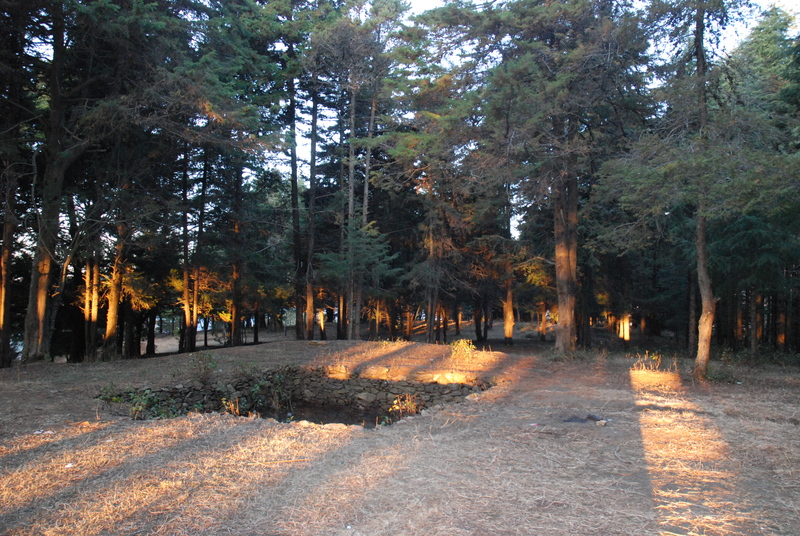 It is a hill top and has some beautiful walks amidst pine trees on one side and deodar on other. One can have beautiful view of valley on either side. Two km from Badshah Thaul at Ranichauri is Angora rabbit farm operated by Hifeed. Off the road, one will have to walk around 200 mts to be there. You can go and see the rabbit farming & breeding and spinning & weaving of the wool. There is a training centre and a hostel as well as research & production facilities. This farm engages hundreds of peoples from 31 villages and 45 self-help groups. Affording an angora shawl might be tough for many but watching it in making isn’t. It is an experience of different kind. This view can be yours a few kms from Badshah Thaul. Badshah Thaul is not too far from Chamba town. Village is just 3 km from Chamba on Tehri road. Here road towards Ranichauri diverts to right and one to Tehri turns to left. When to go: Anytime of the year. Easily accessible, but winters can be quite cold. Transportation: It is well connected because of Garhwal University campus. If you are not driving yourself, once you reach Chamba, you can have local transport as well to take you to Badshah Thaul. Any bus going to either Tehri or Ranichauri will also drop you there. Darbar Hotel & Resorts, Badshah Thaul. Just one km from Badshah Thaul on the Ranichauri main road. As the name suggests, resort is owned by the successors of the custodian family of the erstwhile Purana Darbar of Old Tehri. When Tehri town was awarded a death sentence to give way to a huge dam, the present custodians of the Purana Darbar, removed old artifacts, vintage furniture, ornaments and other items which were otherwise doomed to drown. These all now form the part of décor of the Darbar Resort at Badshah Thaul and other present & upcoming properties of the family at Dehradun (Samar Niwas) and Dhanaulti (Apple Orchard). It is a slice of history in that sense. Talking to Thakur Bhawani Singh, the present custodian of Purana Darbar will be an interesting take on history of Tehri, which was. Family plans to run a live Archival trust at Darbar with all those artifacts on show. Resort has seven rooms and plans many more. Camp Pegasus, Ranichauri. Located at an altitude of 2255 mts. It is 4 km from Ranichauri and 10 km from Chamba. Move ahead towards Pantnagar University Campus from Ranichauri. Main gate of the campus is 2 km from Ranichauri. Move inside campus and pass through for another 2 kms to reach Camp Pegasus across the campus. Nestled between apple orchard and silver oak forests, Camp Pegasus has 5 Swiss tents, 10 other tents and 5 bamboo cottages. Besides a wide range of adventure activities camp also offers a 180 degree view of Himalayan peaks from Bandarpoonch to Nanda Devi. What else, you can chose to have an adventurous start to the stay there and land into camp directly through a small zip line. I was exploring off beat desinations for my upcoming vacations , i was bit sceptical about Darbar Hotels and Resorts and the place itself but this explanation of yours gave a very clean and good moral boost. For sure , I am visiting this place and will share my experiences in some time. Lot depends on what we expect. Firstly, Badshah Thaul area doesn’t have too many good places to stay. Secondly, this place has some heritage connect being associated with family of erstwhile rulers of Tehri. This place will be best experienced in season, when there will be a buzz around. The staff will be on their feet too. All the best!